…we have already surpassed the cumulative emission limit and so emissions must ramp down to zero immediately. The unprecedented reduction in fossilâ€fuel emissions implied by either of these scenarios suggests that it is unlikely that warming can be limited to the 2°C target agreed to in the 2009 Copenhagen Accord. 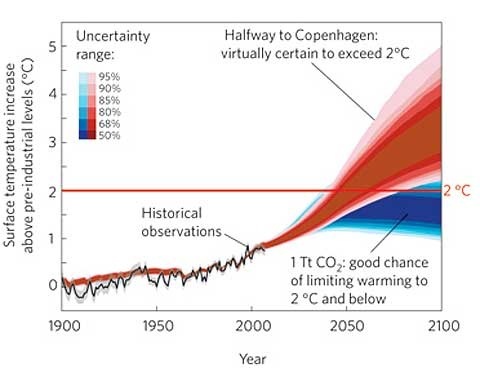 […] our results suggest there is little room (âˆ¼160 ± 80 Pg C) to limit the warming in 2100 to the 2.3°C associated with the RCP 2.6 concentration scenario. It would require an immediate and rapid ramp down of emissions, followed by negative emissions (sequestration) in the later half of this century.